Darleane Christian was born at home in the small town of Terril, Iowa, daughter of Carl B. and Elverna Clute Christian. Her father was a mathematics teacher and superintendent of schools; her mother wrote and directed plays. When Darleane Christian was a freshman in college at Iowa State University, she took a required chemistry course taught by Nellie May Naylor, and decided to pursue further study in that field. She received her B. S. (1948) and Ph. D. (1951) degrees in chemistry (nuclear) from Iowa State University. 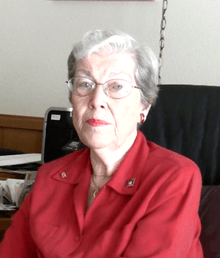 Darleane C. Hoffman was a chemist at Oak Ridge National Laboratory for a year and then joined her husband at the Los Alamos Scientific Laboratory where she began as a staff member in 1953. She became Division Leader of the Chemistry and Nuclear Chemistry Division (Isotope and Nuclear Chemistry Division) in 1979. She left Los Alamos in 1984 to accept appointments as tenured professor in the Department of Chemistry at UC-Berkeley and Leader of the Heavy Element Nuclear & Radiochemistry Group at LBNL. Additionally, she helped found the Seaborg Institute for Transactinium Science at LLNL in 1991 and became its first Director, serving until 1996 when she "retired" to become Senior Advisor and Charter Director. Right after finishing her doctoral work, Darleane Christian married Marvin M. Hoffman, a physicist. The Hoffmans had two children, Maureane and Daryl, both born at Los Alamos. ↑ "Nellie May Naylor". History of Iowa State: People of Distinction. Iowa State University. Retrieved 19 May 2014. 1 2 "Darleane Hoffman: Adventures in the nature of matter". Catalyst Magazine. College of Chemistry, University of California, Berkeley. 6 (2). 1 February 2012. Retrieved 19 May 2014. ↑ "Keynote speaker: D. Hoffman, Ph.D.". LLNL 2020: Women Forging the Future of Science and Technology. Lawrence Livermore National Laboratory. Archived from the original on 4 August 2004. Retrieved 19 May 2014. ↑ "Gruppe 8: Teknologiske fag" (in Norwegian). Norwegian Academy of Science and Letters. Retrieved 7 October 2010.